Apple Eyeing Medicinal Cannabis Device Market? A recently published Apple patent has some wondering if the electronics giant has its sights set on entering the medical cannabis device market. 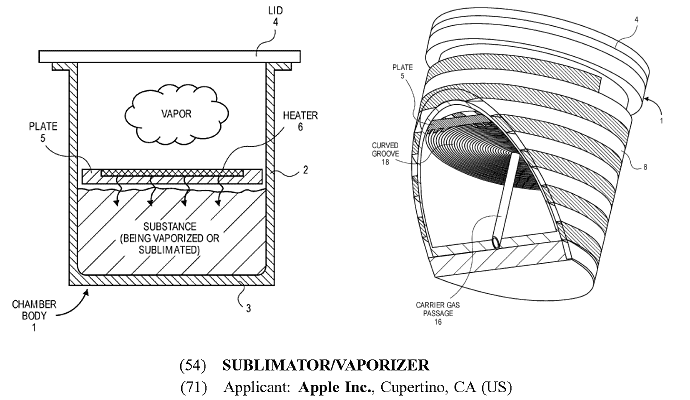 Filed in June last year and only released just a few days ago, the patent is for a “sublimator/vaporizer” – but the patent doesn’t say what will be vaporized in it. “A chamber body is to receive therein a substance that is to be vaporized or sublimated into a vapor,” states the patent. Vaporizers work on the principle of heating a substance without combusting it; the idea being that it can avoid the many toxic and carcinogenic byproducts created when materials are burned. The temperature is set at a level that still releases the active ingredient or desired compound. The Apple patent claims a design that will be more effective than current vaporizer devices; addressing the issue of “cool spots” that lead to an inconsistent vaporization rate. “Vaping” is a term that until more recently has been applied to ecigarettes – devices that heat a liquid that may contain nicotine. These are used as an alternative to smoking tobacco. Vaping is also increasingly being used as a way of delivering medicinal marijuana products. Smoking plant material is becoming somewhat passé. Vaping technology has quickly evolved and it’s grown into a huge market; one the likes of Apple may be well placed to tap given its pedigree of high tech electronics. Apple’s patent documentation can be viewed here. Last year, a peer-reviewed study out of the University of Bern in Switzerland concluded that vaporizers appear to offer a safer and more effective delivery method for medical marijuana applications. In another sign that vaporizers are becoming more accepted as serious medical device, recently we reported cancer patients in the Australian cities of Sydney and Newcastle were being screened for potential participation in Australia’s first clinical trial of vaporised medical cannabis. Another medical cannabis vaporizer we’ve covered in the past that is well past the patent stage is the Syque Inhaler.